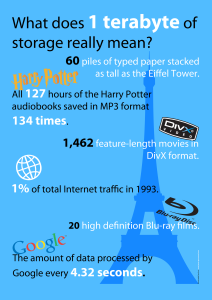 You are here: Home / IT general / Megabytes, gigabits and googolplex – what’s in a number? Is a gigabyte more than a megabyte? A lot of the prefixes have Greek roots, hence the awful pun at the start of this article. You get the picture, a nice neat sequence with each multiplier being a thousand times bigger or smaller than it’s neighbour, all the way up to 1024 and down to 10-24 (tiny amounts that we do not need to go into now). There are more exotic huge numbers, including a ‘googol’ which is 10100, such an improbably large number that mathematicians and scientists describe it in terms of the age of the universe in seconds and comparisons of the weight of the universe compared to a single electron…both of which are still a lot smaller than a googol. There is also a bigger number, the googolplex, but don’t worry these are not coming to PC World or your broadband supplier in the near future. A bit – shortened from ‘binary-digit’ – is the smallest piece of recordable information, but you can’t do much with something that can only have 2 values, until you start putting them together in large numbers. For example 8 bits (2-to-the-power-of-8), traditionally called a byte lets you code (give a numerical value to) up to 256 things, enough for example to code the western alphabet, the digits 1 to 10 with quite a few left for punctuation, and various control characters, i.e. 1 byte holds one piece of information. So a ‘k’ or ‘K’ can refer to 1,000 (base 10) or 1,024 (base 2), not enough difference to be worried about, its enough to know that 1 Kbytes allows the storage of 1 thousand characters, give or take, 1 MByte gives use access to 1 million characters etc. According to the Telegraph the average UK broadband speeds is 18.7Mbps (bits per second) – of course us rural dwellers get nothing like this! [micro] processor speeds, or overall processing power for computers will double every two years. Doubling being an increase of the power-of-2. Similar incredible changes can be seen in the size of memory and network/internet speeds, so maybe we need to get used to a few more the multipliers (peta-, exa-, yotta-?) , and more complicated maths, in our life-time! Back to the question, you should now know that a ‘Gig’ is 1,000 times more than a ‘Meg’, so all other things being equal a 1 GByte file will take 100 times longer to download than a 10 Megabyte file. And a 256k (256,000 bytes of data per second) dial-up modem is just too slow – ask your dad! So it wasn’t a daft question, people need to know these things and feel able to ask without fear of either ridicule or being confronted by more confusing jargon and technobabble. The IT Elementary School is all about making the confusing understandable. You remember when you were at school and you were told that you would need maths (or ‘math’ in the US) in everyday life, well here’s a case where a little bit of applied knowledge is useful. © 2015-2017b IT elementary school Ltd.